Jordan Peele is mostly known for his comedic acting on the tv show Key and Peele. So who would have thought someone like him could direct a Horror/Mystery? If you haven't read any reviews just yet, I will tell you that he knocks it out of the park for directing this as his first movie. Sure there are some comedic moments but the story is not meant for any of that at the slightest. The characters in this flick are; Chris Washington (Daniel Kaluuya), his girlfriend Rose Armitage (Allison Williams), her father Dean (Bradley Whitford), mother Missy (Catherine Keener), brother Jeremy (Caleb Landry Jones) and many more. Chris is a black man with a white girlfriend, and they plan to see Rose's family for the first time for a weekend. Chris is worried how things will go because the family doesn't know he's black but she assures him everything will be okay. Chris is greeted normally but soon finds out things are not what they seem and with Missy being a psychiatrist, he gets the impression he has been hypnotized after the first night. Things happen and the ending is somewhat predictable but it kept me on the edge of my seat the entire time. 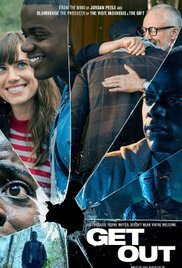 Get Out is not a movie about race but one that must be seen to understand why "getting out" is hard for Chris. He finds out the hard but weird way that the family isn't racist, but are after him for different reasons. Reasons that freaked me out and kept this story going. You won't be disappointed when you leave but the only bad thing I can say is that throughout the film if you catch on early, some things are predictable. Even then you will still enjoy the plot blossom until the very end. I've never heard of Daniel Kaluuya but his acting was great and would like to see him in more upcoming films, and Jordan Peele as well; in both acting and directing.